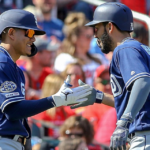 Although San Diego’s baseball team will not be featured in the playoffs, plenty of former or could-have-been Padres have made it to the division playoffs. Among those lucky souls, some play on the field, others manage or coach. Of course, baseball has become a transient sport, so this will come as no surprise. However, Padres fans can still wonder what might have happened if, for instance, the Padres had drafted Justin Verlander rather than Matt Bush. A 42nd-round draft choice for the Padres, Brach made his debut midseason in 2011. During 2012 he pitched regularly out of the bullpen. The following year he became the guy that rotated between the major and minor leagues, but he still managed a 3.19 ERA that year. At the end of that season, the Padres traded Brach for right-hander Devin Jones. This year, the Braves traded for Brach at the deadline. In the meantime, Jones never made it to the major leagues. The Padres drafted high school pitcher Fried in the first round of the 2012 draft. At the time, he was regarded as a solid No. 2 starter. Ranked as the Padres’ top pitching prospect in 2014, he had to be shut down and eventually had Tommy John surgery in August. Later that year, the Padres traded him and three other players to the Braves in return for outfielder Justin Upton. 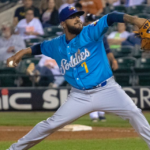 This year, he started the season in the minors, but was called up to the big club in April and compiled a 1-4 record with a 2.294 ERA and 1.37 WHIP. Known for his pitch framing and other skills behind the plate, Rivera joined the Braves as a waiver claim from the Los Angeles Angels this summer. Despite already carrying catchers Kurt Suzuki and Tyler Flowers on the playoff roster, the Braves elected to also include Rivera. 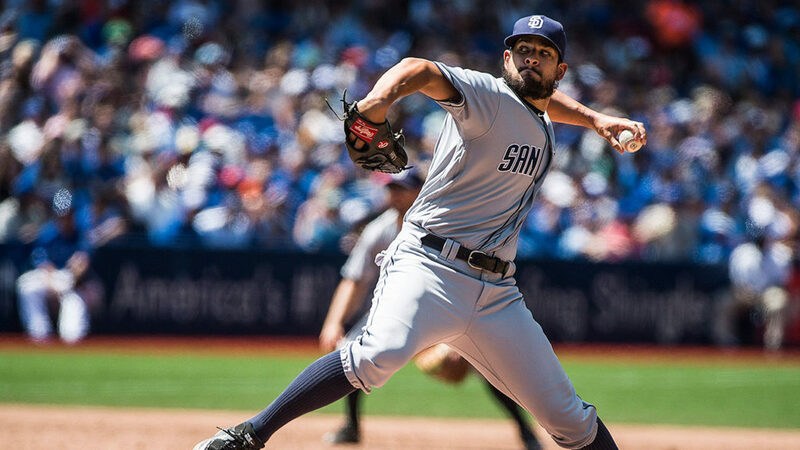 Rivera became known as a “pitcher whisperer” in his time with the Padres in 2013 and 2014. In fact, the Padres thought so highly of Rivera that the team traded fellow backup Nick Hundley to Baltimore. In 2015 the Padres traded Cameron Maybin, Carlos Quentin, Matt Wisler, and Jordan Paroubeck to the Atlanta Braves for Craig Kimbrel and Melvin Upton. 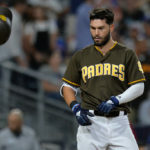 Kimbrel saved 39 games for the Padres, but in the offseason, the team traded him for four minor leaguers, Manuel Margot, Javier Guerra, Carlos Asuaje and Logan Allen. Margot, Guerra, and Asuaje have all made it to the major leagues, with Margot as a regular in center fielder. Results for the three have been mixed at best. Allen moved from AA to AAA this season and compiled a cumulative 2.54 ERA and a 14-6 record. In August he was named Texas League Pitcher of the Year. This year, Kimbrel has saved 42 games for the Red Sox and has a 2.74 ERA. Yonder Alonso (along with Brad Boxberger, Yasmani Grandal, and Edinson Volquez) arrived in San Diego via the trade that sent Mat Latos to the Cincinnati Reds in December 2011. When he checked out Petco Park, which had a reputation as an extreme pitchers’ park, he remarked on the opportunity to spray the ball around the vast territory. He manned first base until the trade that sent him to Oakland in 2015 for Drew Pomeranz and Jose Torres. During his tenure with the Padres, he batted .271/.339/.386/.724. Last year at the trade deadline, A.J. Preller’s elected to hang on to closer Brad Hand. 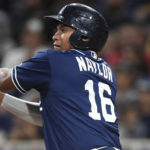 But this year the Padres traded him and fellow pitcher Adam Cimber to the Indians in return for catcher Francisco Mejia, the fifth-ranked prospect in MLB (according to ESPN). With Cleveland, Hand has saved eight games. The Padres initially acquired Hand in April 2016 by claiming him off waivers from the Miami Marlins. In his short time with the Padres as general manager, Jed Hoyer, made a trade in 2010 he later came to regret. In a three-team deal, he sent Corey Kluber, a minor league pitcher who was not highly valued, to the Indians. In return, the Padres received Ryan Ludwick, who was batting .281 at the time for the St. Louis Cardinals. Ludwick became the poster child for the “Petco Park syndrome.” He let Petco’s reputation as a pitchers’ park get in his head and blamed the home ballpark for his .211/.301/.330/.631 batting line. In his career with the Indians, Kluber has compiled a 96-55 record, 3.09 ERA, 1.070 WHIP. In 2016 Kluber helped propel Cleveland to the World Series. But in Game 7 he faltered, pitching only four innings and giving up as many runs. The Chicago Cubs went on to win the game and the series. In Game 1 this year, Kluber gave up back-to-back home runs in a loss to the Houston Astros. The only explanation for his recent struggles lies in the cumulative innings pitched during the regular and postseason the last three years. In 1999, the Padres signed Perez as an amateur free agent, and he reached the major leagues in 2002. Although he struck out more than a batter an inning, the young southpaw had control issues. By August 2003, the Padres had given up on him and sent him to the Pittsburgh Pirates in return for Brian Giles. Perez then began a sojourn that has taken him to from Pittsburgh to five other teams before he landed with Cleveland. This season the bullpen has been the Achilles’ heel for the Indians. However, thanks to a change in mechanics, Perez has helped stabilize the team’s relief pitching. Former major league pitcher Bud Black managed the Padres from 2007 until current general manager A.J. Preller fired him midseason in 2015. During his tenure with the Padres, the Padres had a record of 649-713. The Padres lost to his current team in that notorious Game 163 in his first year. In 2010 under Black, the Padres won 90 games. Hired by the Rockies in November of 2016, Black has led the team to the playoffs in each of his two years with the team. The Colorado pitching staff has thrived under Black and apparently tamed the Coors Field angst that has bedeviled Rockies hurlers for the team’s entire existence. The Astros managed to snag Justin Verlander at the last minute of the trade deadline last year, and he helped lead them to a World Series victory. He’s a workhorse who goes deep in games and has compiled a 21-9 record and 2.32 ERA with the Astros. Verlander became a part of Padre lore when then-general manager Kevin Towers opted to draft Matt Bush as the number one pick in 2004. The Detroit Tigers selected Verlander in the second slot. The less said about this sorry episode, the better. A.J. Hinch managed minor league operations for the Arizona Diamondbacks after he retired from his eight-year playing career as a catcher. In May 2009, the Diamondbacks fired manager Bob Melvin and hired Hinch despite his total lack of experience. Shortly after he lost his job in Arizona in 2010, the Padres hired Hinch as vice president of professional scouting in September 2010. He resigned in August of 2014, no doubt in response to the changes in the front office in San Diego. Shortly thereafter, Hinch replaced Bo Porter as manager of the Astros. In that role, he has led the team to a .577 winning percentage, a World Series Championship last year, and another trip to the playoffs this year. Of course, Roberts will always be remembered for the base he stole in 2004 that helped propel the Boston Red Sox to their first World Series title since 1918. The Red Sox traded Doc Roberts to the Padres at the end of that season, and in 2006 he batted .293 with 49 stolen bases. Roberts retired in 2010 and became the first base coach for the Padres that year. He became Bud Black’s bench coach in 2014 and managed the team for one game after the Padres fired Black. In November 2015 the Dodgers hired Roberts to manage the team. In his first year, MLB named him the National League Manager of the Year. Under Roberts, the Dodgers have a .589 winning percentage and have appeared in the postseason in each year of his tenure. Drafted by the Reds, catcher Yasmani Grandal arrived in San Diego via a trade that sent pitcher Mat Latos to Cincinnati. In his tenure with the Padres, he appeared in 216 games and compiled a batting line of .245/.350/.412/.763. During Preller’s trade fest of 2014, he sent Grandal, among others, to the Dodgers in exchange for Matt Kemp and Tim Federowicz. Grandal has a reputation as an excellent pitch framer. He’s appeared in 140 games this season for the Dodgers and batted .241/349/466/815. In July, he put up a .524 OBP. He’s been behind the plate for the first two Dodger victories in the playoffs, including Clayton Kershaw’s eight scoreless innings in Game 2. The Padres did the Dodgers a favor by trading for Kemp in December 2014. Los Angeles had been desperate to rid themselves of Matt Kemp’s contract because of his declining skills in the outfield, an attitude problem, and a huge contract. The trade also paved the way for a youth movement in L.A. and the call-up of outfielder Joc Pederson. Although Kemp could still hit, he proved to be a liability in Petco Park’s spacious outfield. Apparently, his attitude problem arrived in San Diego with him. 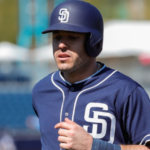 By July of 2016, the Padres decided to move on, sending Kemp to the Atlanta Braves for Hector Olivera, whom the team promptly designated for assignment. Kemp ended up back with the Dodgers in a trade designed to get pricey players like Adrian Gonzalez off the roster. However, Kemp has proven to be more valuable than expected thanks to his hitting. Last year, Preller put together a bargain-basement starting rotation of Clayton Richard, Jared Weaver, Trevor Cahill, Luis Perdomo, and Jhoulys Chacin. Weaver, a three-time All-Star during his time with the Los Angeles Angels, soon realized his time was up and retired. San Diego traded Cahill at the trade deadline, and Chacin turned in the best performance by far with a 13-10 record and .350 ERA. The Padres chose not to re-sign Chacin, and he signed with the Brewers in the offseason. 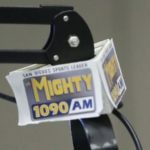 Currently the bench coach for the Brewers, the Padres hired the former Arizona State University baseball coach as the manager of the Tucson Padres after the 2012 minor league season. After firing Bud Black in 2015, the Padres surprised just about everyone by selecting Murphy as interim manager. 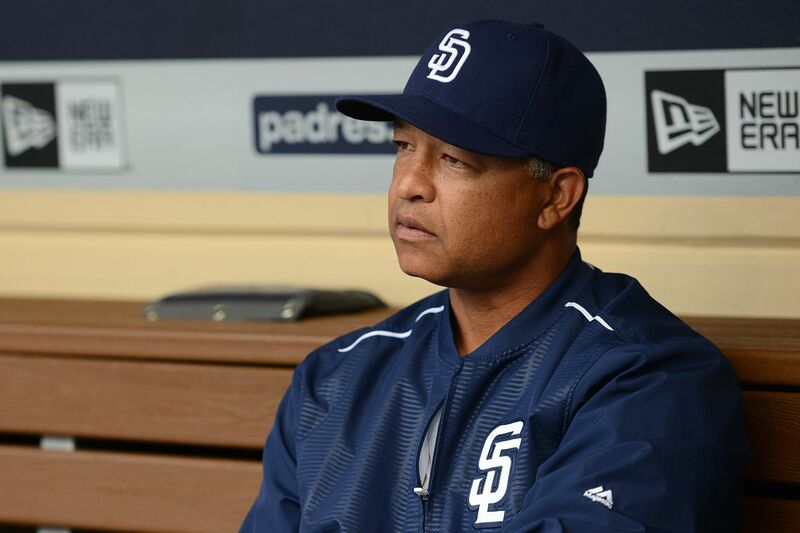 Dave Roberts, another candidate for the job, remained as bench coach for the rest of the season. Under Murphy, the Padres finished the season with a 42-54 record. The Brewers hired him a the end of the season. While a number of ex-Padres made it to the postseason this year, the team itself has not made a playoff appearance since 2006. That year, the Cardinals defeated the Padres 3-1 in the National League Division Series. Since then, the highest finish in the division came in 2010 when the Padres won 90 games and came in second to the ultimate World Series champion San Francisco Giants, managed, ironically, by former Padres skipper Bruce Bochy. I guess you should be commended for being consistent. There will always be a portion of the fanbase focused on this and hindsight is always 20 20. Regardless, if this is your take that AJ, It’s not that impressive of a list. I mean really is Verlander on the Padres enough to get them to the second WC? They aren’t winning 25 more games in 2018. Let’s ignore that it was Josh Byrnes that moved Brad Brach but even still the Pads have a better version. His name is Craig Stammen. Max Fried? Please. Were you watching last night? All he could get over was offspeed pitches and a hitter like Muncy was jut getting his timing down and showed him how his stuff played. Much like Wisler, Fried was the top of the farm back then and they have been noting more than .500 back of rotation starter at best. Rene Rivera, how many catchers does one organization need? Kimbrel and Hand are in the same boat, why have a high priced closure on a bullpen that wins less than 70 games? You can’t overlook the 2018 bullpen got better in every statical category after Cimber and Hand were traded. Logan Allen could be the arm that makes some noise at the ML level and there is still time for Manuel and even Javy. Cory Kluber, your best arguement of those listed was moved by the almighty Jed Hoyer not AJ. Looking at his past two postseasons, he is a wonder in the regular season and Kershaw like in the post season. Grandal was expendable and is barely better than the one who made him expendable. Kemp has shown in both ATL and now with the Dodgers his lack of performance in SD rest squarely on him being out of shape and a bad attitude. The skill was still there. If you really think, Bochy, Murphy, and Roberts would have the same success with this roster as they enjoyed with who they have: I can’t help you. II thought it was an interesting subject. Period. It is an interesting subject! 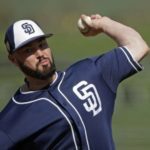 Had the Padres drafted JV and had both he and Peavy in the rotation at the same time, that would have been two starting pitchers of Cy Young caliber. Not sure where you derive this article is an AJ basher? From what I read, the author the lists the players /coaches the padres traded or let go or did not draft but could have, regardless of who was actually making the decision. You are right, Peter. I checked those playoff rosters multiple times and obviously had a brain cramp. Who could forget Jordan Lyles? Thanks for reading. You forgot Adam Cimber on Cleveland, Jordan Lyles on Brewers.